Trump’s refusal to release his tax returns was his biggest violation of norms of conduct for presidential candidates—and most Americans are still mad. Donald Trump and his surrogates claim that the public doesn’t care about his tax returns. Polls consistently find that they’re dead wrong, and even most Republicans think he should release them. On Saturday, at least 120,000 people took to the streets in dozens of towns and cities across the country to drive that point home, according to an unofficial estimate provided to The Nation by Joe Dinkin, national communications director for the Working Families Party, one of a coalition of 69 groups behind the protests. As one might expect, there were big crowds in New York and DC and Los Angeles and in other big blue cities. 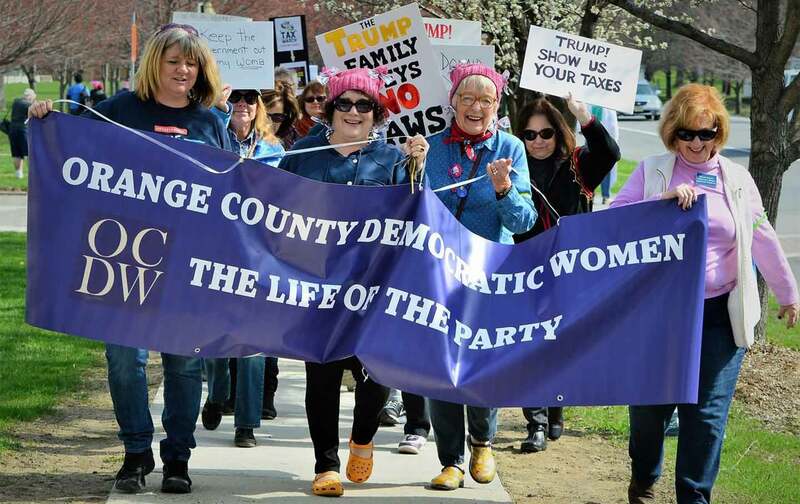 But forecasts calling for scattered showers didn’t keep around 350 protesters from coming out in Goshen, New York, a bedroom community of around 15,000 mostly white people, 65 miles or so north of Manhattan. In one sense, the Tax March was narrowly focused, but the salience of Trump’s refusal to release his taxes goes beyond what they might reveal about his net worth or potential conflicts of interest. It was his biggest violation of long-agreed-upon norms of conduct for presidential candidates—as Kevin Kruse wrote for Esquire, he was the first candidate to refuse to release a detailed accounting of his finances since Watergate—and he got away with it. The same media that reported almost obsessively on Hillary Clinton’s private e-mail server, another process story, largely forgot about Trump’s taxes. We can’t know what’s in Trump’s head, but having gotten away with being the least transparent candidate in modern presidential history signaled that he could run the least transparent administration–and continue profiting from the family business–with impunity. Trump has somewhat gleefully asserted that the conflict-of-interest rules don’t apply to the president. He mixed together personal business and official diplomacy during several meetings and conversations with foreign officials during the transition. And despite his widespread private holdings in commercial real estate, condominiums, hotels, and golf courses here and around the world, he has refused to follow the lead of his predecessors by selling his assets and placing the proceeds in a blind trust. Instead, he has transferred management, but not ownership, of the Trump Organization. He retains his ownership in full. And he has assigned operational responsibility not to an independent arm’s-length trustee, but to his sons, Eric and Donald Jr.
Trump’s taxes would probably reveal more hidden conflicts. Perhaps more important, enforcing the norm that presidents must be transparent about their personal finances—and the law barring them from profiting from the office—would signal that Trump isn’t an emperor and can’t just operate above the law with impunity. After promising repeatedly to release his taxes at some point in the future, Trump’s made it clear that he never will. Congress has the power under a 1924 law to force his hand, but in February, 229 House Republicans voted to keep his tax returns from the public. Their refusal to provide oversight is why Democrats winning back the House in 2018 is so important. Ultimately, it’s also why tens of thousands of Americans felt that they needed to take to the streets last weekend.